Remember the days when you were little and you spent hours coloring? How carefree it was? Relaxing? Fun? But now you’re an adult and coloring a My Little Pony coloring book or other cartoon character would be a tad embarrassing. However, I miss the joy and relaxation that coloring would bring me. Lucky for me there are now adult coloring books! My Masterpiece has made an adult coloring book full of mandalas. Now I can have a fun, relaxing time coloring my mandalas while my daughter colors in her books. The Mood Enhancing Mandalas is full of intricate and beautiful pages, all of which are one sided. There’s no need to worry about markers bleeding through and ruining the next page. The paper is a nice weight that I would say you could even frame and it would look nice. A great way to decorate a dorm room would be to color a few pages and frame them. I prefer to use a high quality colored pencils for the Mandalas. Since some of the pages are very detailed and intricate I find that the pencils allow me to really highlight the details. Plus with a pencil I can vary the pressure I’m apply to change the richness of the color. And I also feel like more of an adult using colored pencils than crayons. If you miss coloring I highly suggest picking up the Mood Enhancing Mandalas adult coloring book. You should also pick up a box or two of colored pencils and an electric pencil sharpener. Because once you start coloring you’ll find yourself wanting to do color all the time. I also feel this is a great way for you to take some time out of the day and bond with your child. But now you won’t have to color a cartoon character. You can color a relaxing mandala. 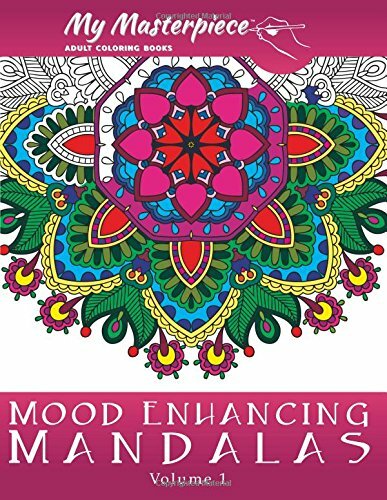 You can pick up your own copy of Mood Enhancing Mandalas on Amazon.